While it may be massively overpriced, the B&O has produced the best sounding TV yet that's also pretty good with hi-def. At around £1,800 this is a pricy TV for its size. It's also one of the most disappointing, in terms of versatility. While most TVs in its class have two HDMIs, the BV8 has just one. This is plain reckless if you consider that most home entertainment kit will have traded Scarts for HDMIs before much more time is up. Do you really want to spend you entire life changing cables over? We know we don't, but the BV8 is still worth knowing about despite shooting itself firmly in the TV stand. It has a sophisticated design and a minimalist look that's contained within a rubberised cabinet. Build quality will not be a problem so you can expect the BV8 to be around for a long, long time. 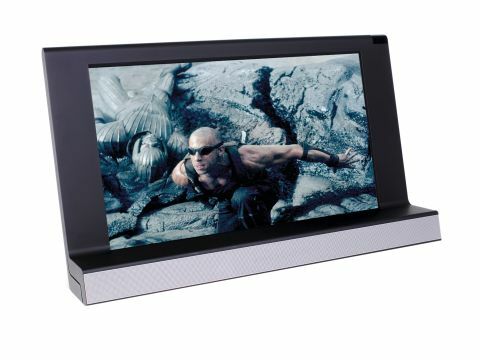 The Danish company has created an unusual design with the BV8's speaker actually protruding from the TV. Positioned under the screen, the speaker points towards you so that the sound appears to be coming more directly from the actors' mouths. It does, however, mean that the viewing angle of the TV itself is somewhat fixed, and possibly in the wrong position for some of the viewers. This could be a disadvantage if you have friends or family. A removable cover on the set's rear hides that precious single HDMI input as well as a component video input, two Scarts and a PC input. Its onscreen menus are not the finished article and setting up the TV can be tiresome. It is worth it though because the BeoVision 8 turns out to be one of the stronger picture performers around. Vivid colouring and realistic skin tones prove to be the high points, while a good degree of sharpness pulls out a lot of detail from Hot Fuzz in hi-def. Sadly, black levels are not so impressive. When Angel comes across Sandford's branch of the Neighbourhood Watch in full murderous swing, the action can't match the depth of rival sets. That aside, hi-def pictures are excellent and don't suffer from any discernable blur or judder. The onscreen action is also heightened by the BV8's benchmark speakers. That odd design reveals itself as a cunning disguise for possibly the best TV speakers ever made. The stereo is separated very effectively and a good dollop of bass gives a powerful rendition of full action sequences and simple dialogue scenes alike. It's not worth £1,800, but the BV8 is a unique and highly skilled TV.